I have been doing other things than fiddling with timber projects. 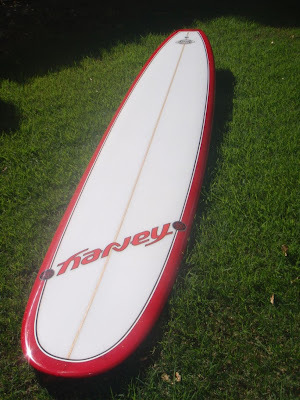 This is a traditional soft roll bottom, similar to what I had shaped for Ray Gleave (name dropping) many years ago. 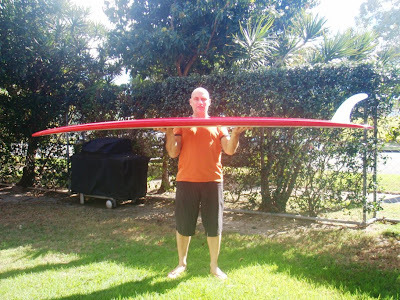 9’6″ x 23″ x 3″ and a flow through nose concave, plus a candy apple red tint glass job with metallic gold. 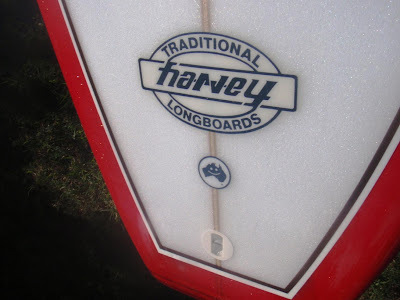 A laminated multi coloured timber tail block which comes standard on all longboards. Click on any of the pics to get a larger version. A couple of new parabolic hollow glass hardbond rail stringerless quad fish (that’s a mouth full) will be finished by the end of the week, plus more. See I have been busy.